High cost of equipment, growth in public & private infrastructures, demand in mining industry and ease of availability of equipment on rent have fueled Saudi Arabia's earthmoving equipment rental market. The continuous growth in the construction industry coupled with surging government expenditure has further driven the growth of the market. In Saudi Arabia, excavator and construction tractors are the key revenue generating segments. According to 6Wresearch, Saudi Arabia's Earthmoving Equipment Rental market is projected to grow at a CAGR of 12.3% during 2015-21. Mounting construction industry in areas such as hospitality sector, IT/ITeS sector, public and infrastructures have spurred earthmoving equipment rental business in the country. In Saudi Arabia's earthmoving equipment rental market, construction application is the leading revenue generation application and is anticipated to maintain its market dominance through the forecast period. The growth registered in Saudi Arabia's construction sector has played a vital role for this application market leadership. The report thoroughly covers the market by Earthmoving Equipment Rental types, by verticals, and by regions. The report provides the unbiased and detailed analysis of the on-going trends, opportunities/high growth areas, market drivers which would help the stakeholders to device and align their market strategies according to the current and future market dynamics. • Historical data of Global Earthmoving Equipment Market for the Period 2010-2014. • Market Size & Forecast of Global Earthmoving Equipment Market until 2021. • Historical data of Saudi Arabia Earthmoving Equipment Rental Market Revenue for the Period 2010-2014. 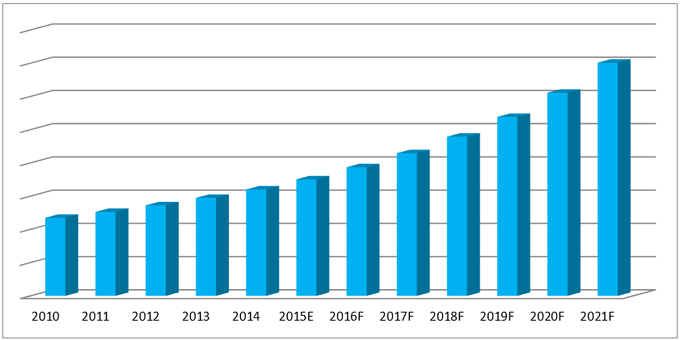 • Market Size & Forecast of Saudi Arabia Earthmoving Equipment Rental Market Revenue until 2021. • Historical data of Saudi Arabia Excavator Rental Market Rental Revenue for the Period 2010-2014. • Market Size & Forecast of Saudi Arabia Excavator Rental Market Revenue until 2021. • Historical data of Saudi Arabia Loader Rental Market Revenue for the Period 2010-2014. • Market Size & Forecast of Saudi Arabia Loader Rental Market Revenue until 2021. • Historical data of Saudi Arabia Construction Tractor Rental Market Revenue for the Period 2010-2014. • Market Size & Forecast of Saudi Arabia Construction Tractor Rental Market Revenue until 2021. • Historical data of Saudi Arabia Motor Grader Rental Market Revenue for the Period 2010-2014. • Market Size & Forecast of Saudi Arabia Motor Grader Rental Market Revenue until 2021. • Historical data of Saudi Arabia Earthmoving Equipment Application Rental Market Revenue for the Period 2010-2014. • Market Size & Forecast of Saudi Arabia Earthmoving Equipment Application Rental Market Revenue until 2021. • Historical data of Saudi Arabia Earthmoving Equipment Regional Rental Market Revenue for the Period 2010-2014. • Market Size & Forecast of Saudi Arabia Earthmoving Equipment Regional Rental Market Revenue until 2021. 14.12 Zahid Tractor & Heavy Machinery Co. Ltd.
Saudi Arabia is one of the key growing Earthmoving Equipment Rental Market. Growing construction and mining industries, urbanization rate and increasing tourism in the country are the key factors that are encouraging the market for rental earthmoving equipment in Saudi Arabia. In the country, the market is primarily driven by excavator followed by construction tractor and loaders. However during forecast period, construction tractor market share is expected to decline loader. The key players in the market include: Bin Quraya, Zahid, ISDC, Al Shuwayer Group and Nabil Talib Contracting Est., Arabtec Construction Machinery (ACM) and Al Reyami Construction Equipment Rental.